Game On is book two in the Lewis Creek series, a companion novel to Play On. Play On has been in my TBR pile since I heard about it around it’s release last year, so I was excited to receive a copy of Game On to review. I mean small towns, baseball, southern charm, and falling for the neighbor next door? That sounds just like the kind of book I’d enjoy, and I wasn’t disappointed. Eric Perry is in need of a little redemption. He’s finally off the bench this year as Lewis Creek’s newest starting pitcher. However, now that the spotlight’s on him, everyone knows about his troublemaking ways and wants him off the team. After his coach bails him out of jail for a second, and this time final, time, Eric needs to shape up quick and face some consequences. One of them being community service with his neighbor and childhood friend, Bri Johnson. After ending a terrible and emotionally abusive relationship, Bri is trying to find herself again. She’s alone constantly due to her father’s job as a truck driver. In need of someone, Bri turns to Eric, who, even though they haven’t really been friends these past couple of years, is in need of someone to turn to, too. Game On definitely had a huge Friday Night Lights vibe going on, which I loved. It even had it’s own Coach Taylor, who I couldn’t help but see as Coach Taylor from Friday Night Lights. I really did love how much Coach Taylor was a part of the book and how he supported Eric (and even Bri). Small towns sure can have a lot of politics with their high school sports teams, and Lewis Creek is no exception when it comes to baseball. The whole time I was hoping that the town would just give Eric a break. Yes he screwed up majorly, but he was becoming better and everyone just needed to realize that. The romance between Eric and Bri was sweet but definitely a slow build. Most of the book focuses on them repairing their friendship, which was so, so important. Though, I have to say, I do wish there was a little bit more romance once they became a thing. I was happy with how they finally got together and the ending, but I definitely wish we could’ve seen more of them together! I really enjoyed Eric’s family as well as Eric and Bri’s friends, but I definitely wanted to see more of all of them. I would love to read more stories in the Lewis Creek world, especially if it involves their friends or Eric’s sister. I also wanted to see more with Bri’s dad and with soccer. The book is told in dual POVs, but there seemed to be just a tad bit more about Eric and I would’ve liked some more about Bri. 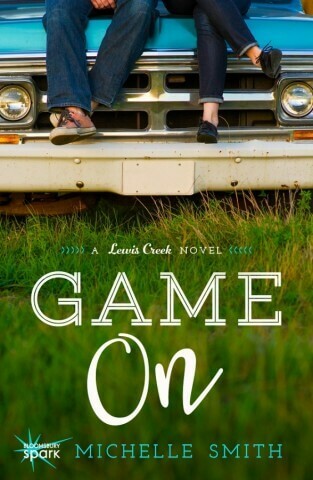 Overall, I enjoyed Game On and I think fans of Katie McGarry and Miranda Kenneally will enjoy it, too. I look forward to reading Play On and any other books that might be planned for this series. This was a good read can’t wait to hear more!!! Hope you can follow me on my blog! I hope you enjoy GAME ON if you read it! I finished this one recently and enjoyed it! I did get a little irritated with the characters because I found them to be a bit whiny, and Eric just kept making the same bad decision over and over again, but I still thought it was fun & cute! I agree that Bri’s POV wasn’t as developed as Eric’s. I definitely loved seeing his chaotic family, though. Great review! I definitely understand why the characters irritated you a little bit. It didn’t bother me too much, though, but I agree that Eric making the same bad decision over and over was annoying. Thanks!